Graduation is a time filled with happiness, a feeling of accomplishment and the knowledge that you no longer have to worry about final exams. But, it also is a time that many students are ill prepared for, and they don’t even know it. Sharon Lundeen, Personal Finance Professor, said she believes that students aren’t fully prepared for financial life beyond the classroom. “They live at home, are working part-time and think they can handle it. Then they get their own apartment and realize they can’t afford it,” Lundeen said. She said she thinks that many students aren’t learning all of the necessary financial lessons at home or at school and that debt management seems to be the downfall of many graduates. “Part of that is because a lot of people grow up thinking that it’s normal to carry a balance on a credit card,” Lundeen said. Which is why situations like the one depicted in the cartoon below are all too common these days. With the decline of the economy and jobs becoming harder and harder to find, recent graduates are finding themselves in a tough financial position. Once the excitement of graduating wears off, they’re faced with the tough reality that school is expensive. 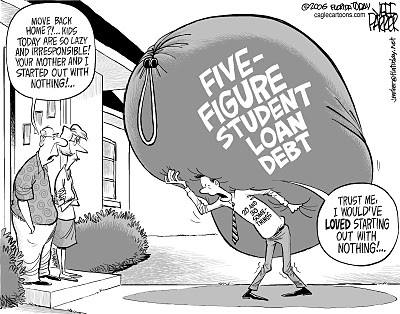 Not only that, upon graduation, many students are starting out their lives already in debt. “I really think a lot of students don’t have the breadth of knowledge to handle everything [after they graduate],” Lundeen said. According to the Project on Student Debt website, graduates in 2010 held an average debt of over 25 thousand dollars. Add in a national unemployment rate hovering around nine percent and you realize that landing that high paying job right out of school is not likely to happen. But you can prepare yourself. Lundeen said that this generation of graduates is at a great advantage because there is so much information available o the internet that target new grads and lay out a recipe for students who are just starting out. Here’s some of the advice that’s out there. According to ehealthinsurance.com, it’s important to understand the value of health insurance and why you need it. While recent changes to health care laws have allowed parents to keep their college-aged students on family medical plans, recent graduates don’t often take into account the fact that they will eventually have to start paying for their own insurance. If you don’t have insurance, or aren’t covered by someone else’s plan, you can get a quote here. 2. Start saving for retirement. Another important thing that graduates don’t think about is their retirement. THe fact that you’re young gives you a huge edge if you want to be rich in retirement, according to bankrate.com. Most companies offer a retirement plan. If yours does, be sure to sign up for it, especially if your employer matches contributions. If there is no contribution match, look into a Roth IRA and set up your contributions to come out of your paycheck and go directly to your Roth IRA. You can learn more about how a Roth IRA works at the IRS’s website. Finally, start an emergency fund. Most experts recommend a savings account that earns interest. Your emergency fund should hold enough cash to cover expenses for six to nine months, in the event that you became unemployed or were unable to work. If your company offers electronic deposits, it’s a good idea to dedicate a portion of your salary to deposit directly into your savings account. If you need more convincing that this is important, read this related article from Kiplinger‘s website. Lundeen offers some other advice; when you’re selecting your courses, and deciding on a major, take a step back. think about potential job opportunities that will be available upon graduating. She also recommends weighing the type of lifestyle you want to live (and what you’re willing to sacrifice to achieve it, i.e. moving or traveling) against the estimated earings for an entry-level position in the field you choose.